In many Connecticut towns, it's not uncommon to spot wild turkeys along the side of the road or even in the road. I've never hit one, but I still wish they'd take a cue from their domestic brethren at Gozzi's Turkey Farm in Guilford, Connecticut, where turkeys don DayGlo colors a few weeks before Thanksgiving. The brightly colored turkeys at Gozzi's, located at 2443 Boston Post Road (Route 1) in this historic shoreline town, have mystified and amused kids and adults for about 50 years. My daughter and I had a blast observing and photographing these feathered fowl at Gozzi's one November. "They're amazing!" she said of the dazzling birds even before they all lined up behind her for a parade around the turkey pen! I didn't ask how the turkeys attain their Easter egg shades. Why ruin the mystery? But I did learn fresh turkeys for Thanksgiving or Christmas should be ordered two weeks ahead if possible. 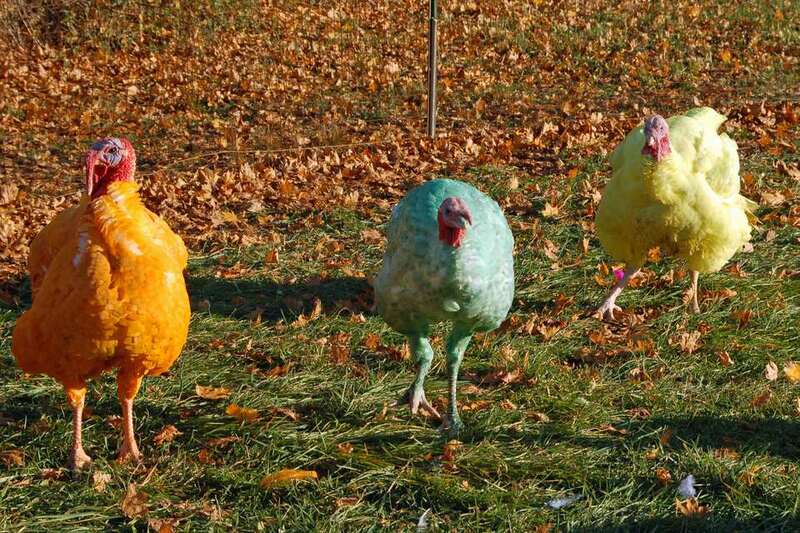 Call 203-453-2771 to order or to verify colorful turkeys are on view. They're typically on display every day through Christmas, weather permitting. Bishop's Orchards: For farm-fresh pies to serve with your Thanksgiving feast. Guilford Art Center: The gallery here is open free to the public, and the shop is stocked with one-of-a-kind works and handcrafted jewelry and gifts by American artists and artisans, perfect for holiday gift-giving. Families have flocked to Gozzi's Turkey Farm in Guilford, CT, for about 50 years to see these unusual turkeys. This yellow turkey isn't a chameleon who's changed his feathers to blend in with New England's autumn foliage. I know because the yellow gobbler is in colorful company around the water cooler at Gozzi's Turkey Farm, where turkeys also turn shades of orange, pink, purple and green in the weeks leading up to Thanksgiving. If you're dying to know how the Gozzi family turns turkeys into colorful works of art each Thanksgiving, look carefully at the orange and pink turkeys in this photo. Their white feather "roots" are showing. The color is just harmless dye. During the half-hour we were at Gozzi's Turkey Farm, we only heard the turkeys erupt in a full-blown "gobble!" once, but they were making garbly, muted gobbling sounds almost constantly. It was fun to listen to their chatter and ponder its meaning. My daughter asked me the name of the red skin flap dangling over this orange turkey's beak. Of course, I couldn't come up with it on the spot. I Googled "name for turkey nose thing" when we got home, though, and we learned it's called a snood. When you're just one vibrant turkey in a rafter of colorful turkeys, what do you do to draw the crowd's attention? You splay and shake your tail feathers! My 8-year-old daughter refused to choose a favorite, but I liked this hot pink turkey best. Even her legs were pink! Ben Franklin didn't get far with his proposal to make the turkey our national bird. Perhaps if his fellow founding fathers had seen this pretty pink turkey, we'd be eating bald eagle on Thanksgiving! The turkeys at Gozzi's aren't at all camera-shy. This green turkey looks as though he's expecting a Thanksgiving reprieve and dressing for the holiday season. Gozzi's Turkey Farm in the shoreline town of Guilford, Connecticut, sells fresh turkeys not only for Thanksgiving but for Christmas. Suddenly, the turkeys all turned their attention to my daughter, who led them on an entire lap around the turkey pen. She got such a kick out of leading a turkey parade! When she tired of marching, she tried to teach the turkeys how to moonwalk. A turkey can sure work up an appetite mugging for the paparazzi. Gozzi's turkeys seemed to enjoy the attention of visitors who stopped to appreciate their colorful finery. Here's hoping our friends find jobs as breeders—not roasters—this holiday season. Before You Deep Fry That Turkey, Read This!